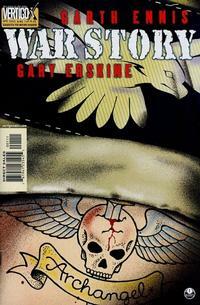 Garth Ennis’s second series of War Stories came out about a year after the first group. The format was again a series of four 56-page one-shots (with a cover price of $4.95). Although well done, for some reason I found them less memorable than the first series. Perhaps it was due to the rather obscure corners of war explored here. The focus is still on the individual soldiers being profiled, and they are a varied lot. 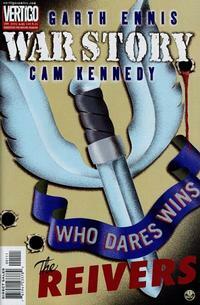 The series begins with “The Reivers,” illustrated by Cam Kennedy. It’s about an SAS unit fighting Germans in the North African desert during World War II. They are led by two very different officers, who disagree on many things. The story takes its title from the border reivers, guerilla fighters who lived in The Marches, the border area where Scotland and England meet. When the unit adds a secondary target to a mission to destroy an airfield things quickly begin to go wrong. The reiver description of “hard men who come out of nowhere, strike fast, give no quarter, disappear again” applies…except for the “disappear again” part. 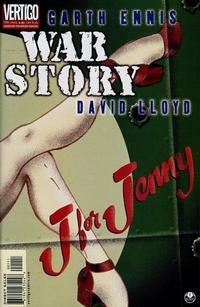 “J for Jenny” was illustrated by the ever-dependable David Lloyd. It tells the story of a World War II British bomber making runs into Germany. Some crew members have begun to question the morality of bombing civilians, despite their own hard memories of the German Blitz. But flight lieutenant Ronald Page is completely bloodthirsty, apparently seeking nothing but revenge for the loss of his family. When his bomber is shot down during a mission, Page stays at the controls. His flight engineer tries to prevent a final homicidal act, realizing too late that Page was trying to save the lives of the German civilians in the town below. A striking twist ending, one of the best in either series. The third tale, “Condors,” was illustrated by Carlos Ezquerra. It’s set in the Spanish Civil War for a change, but it looks backward to World War I as well as forward to the upcoming World War II. Four soldiers from both sides of the conflict have taken refuge in a foxhole, and they while away the time until nightfall by telling stories about how they got there. They are a diverse group–English, Irish, German, and Spanish–and in addition to the war stories (theirs and their parents’) the conversation touches on other matters like the Irish conflict and the rise of Nazism in Germany. The story title comes from the Spanish soldier’s description of the others: he compares them to vultures hovering over the battlefield, each taking what they want from the carnage. It’s arguably the richest of any of the War Stories, even if it is talkier than most. I did think the bleak epilogue describing the eventual fates of the four soldiers was overkill. I would have been happy to leave it at them dispersing at nightfall, hopefully wiser for the experience. The final War Story in the second series was “Archangel,” illustrated by Gary Erskine. It tells the story of an R.A.F. fighter pilot who gets volunteered for a new experimental CAMship. CAM is an acronym for “Catapult Aircraft Merchantmen,” which uses a catapult to launch a fighter plane from a merchant ship, giving a convoy air protection without having an aircraft carrier. I confess that I had never heard of the program. It’s just crazy enough to look like a comic book invention, but like everything else in these stories it is based in true history. Despite his reluctance going in, flight officer McKenzie performs brilliantly on his first catapult mission. The triumph is muted by the reminder that he’ll have to go back and do it again. As long as the war continues, no victory in battle is final, as Ennis reminds us over and over during the course of this entire series of stories. 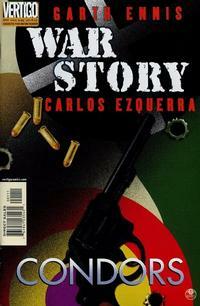 This entry was posted in miniseries, Vertigo comics and tagged Cam Kennedy, Carlos Ezquerra, David Lloyd, Garth Ennis, Gary Erskine. Bookmark the permalink.